Japan is known for its cool and unusual snacks because their use of aesthetic and flavors always grab attention. 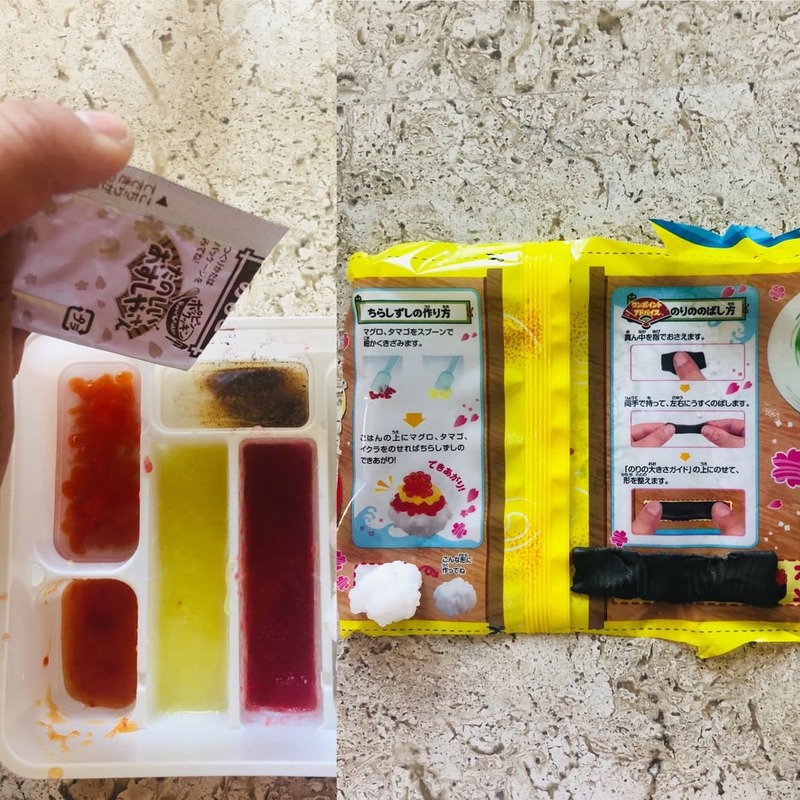 Years ago I came across a YouTube video of someone making sushi candy out of powder and water. There was no explanation, just the quiet sounds of a little plastic spatula mixing the powder together. Now, years later on an every day trip to 7-Eleven, I came across the same cute box with illustrations of delicious sushi gracing the cover. It made me stop in my tracks. How did this 7-Eleven even consider ordering this? 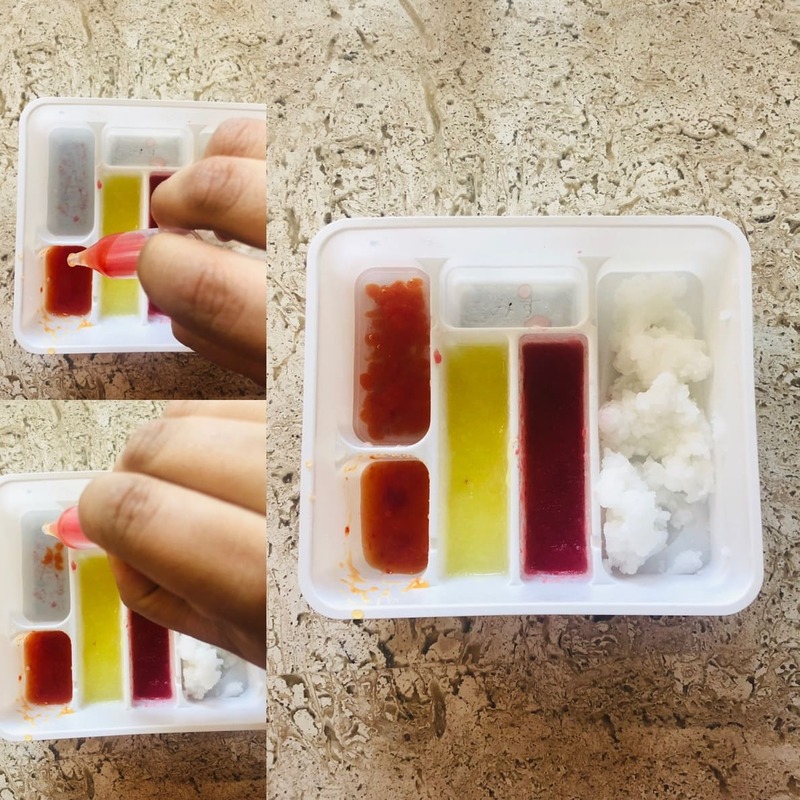 It doesn't even matter, my time had finally come to give this tiny food kit a try. This adorable little box depicted what I guess should come of this project. The instructions on the back seemed simple enough. The arrows show where to begin and where to take it. 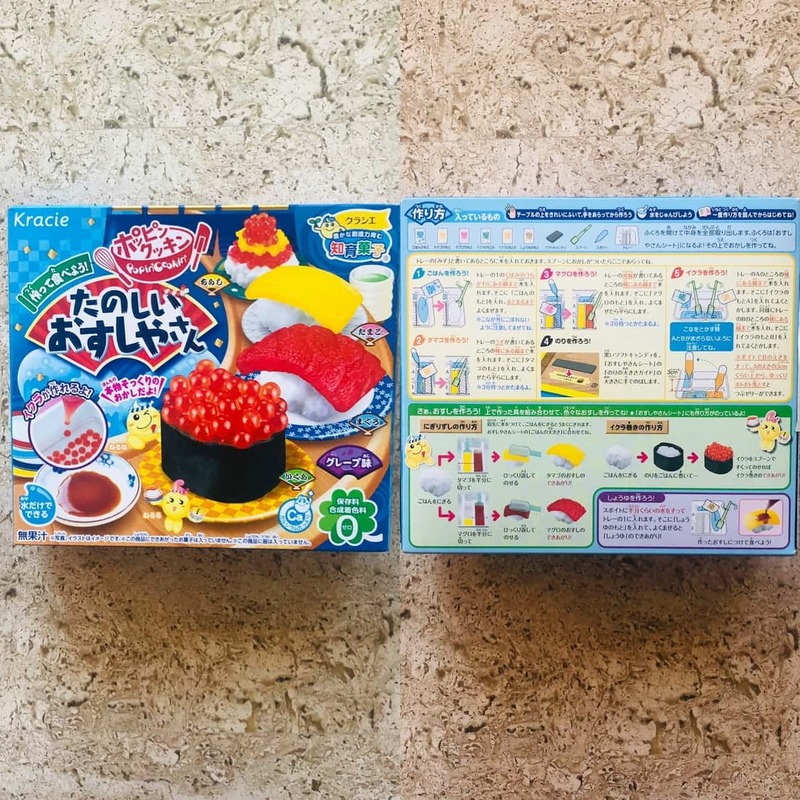 The Japanese was cryptic to me, but luckily the box directs you to Popin' Cookin's website where you can find instructions in English. 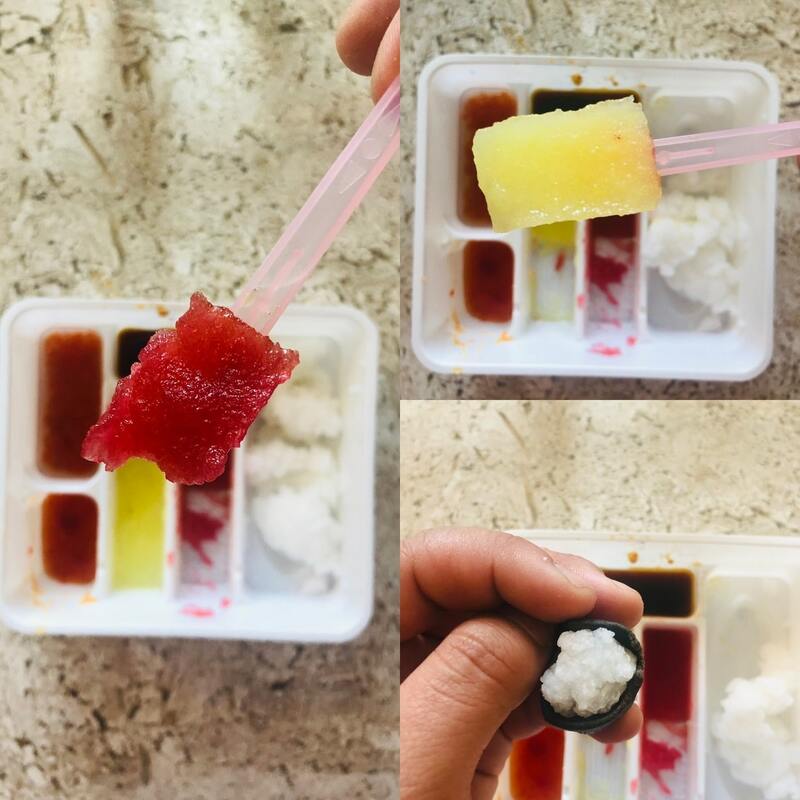 When you open the little package you get an assortment of packets, a tiny plunger and spatula, and a small black rectangle of "nori." Each of the little packets will make either rice, tuna, egg, salmon roe, or soy sauce. 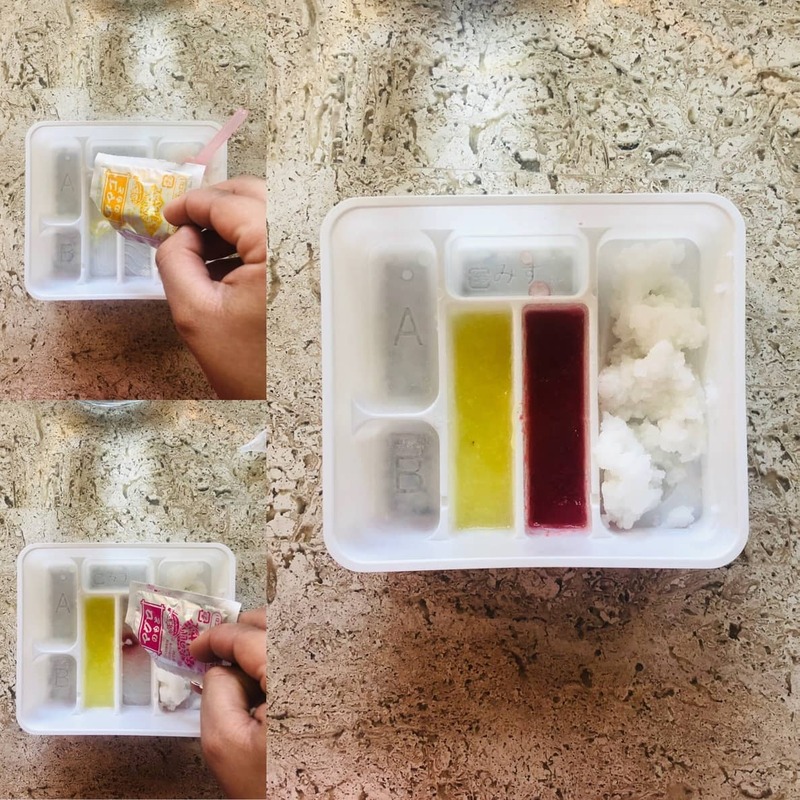 The little plunger is to put the perfect amount of water for each section of this bento box. The packaging itself serves as a guide for how big to make your rice ball and how long to stretch out the seaweed. 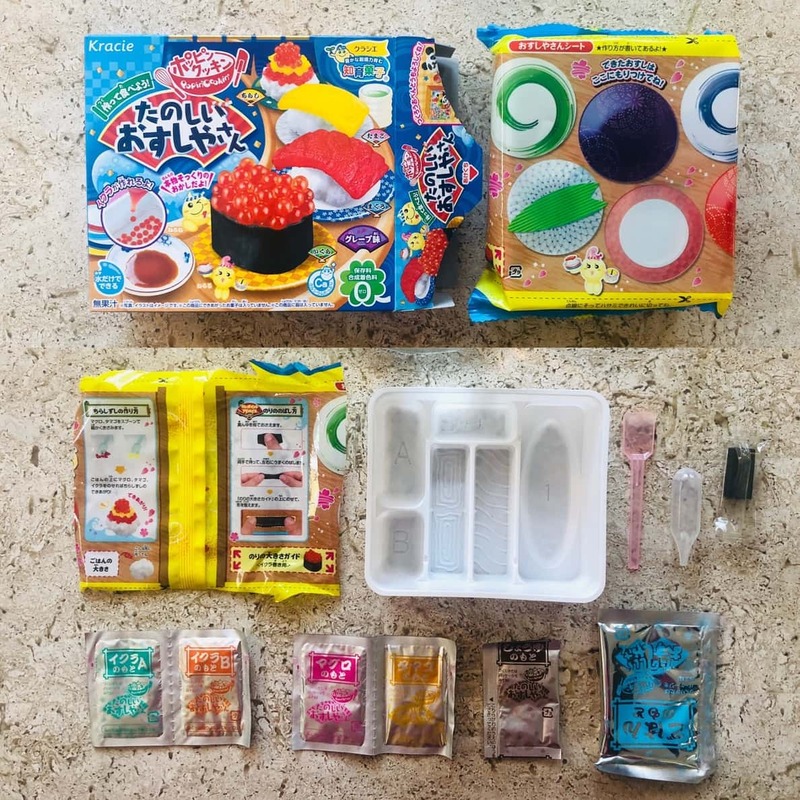 There's one thing strange about this kit: The box says "sugar powder cake mix," with its online description stating it as grape flavored, though all I can smell is bubblegum. The "rice" looks and has the exact texture and stickiness of sushi rice which is a little eerie. I don't know what to expect of the taste. Next comes the egg and tuna mixes. Each of their sections have little details of swirls and lines so that the gelatinous mixtures will have the markings of egg and tuna. Since the box says to wait 3 minutes for it to form, let's move on to what else we can get into in this box. Now, for what I was really fascinated by: The salmon roe. This requires a watery mix for the orange-hued liquid to be dropped into in order to form the tiny balls of "roe." As a side note, handling the plastic spatula was an experience within itself. When mixing the powder, the spatula makes light scratching noises against the plastic. 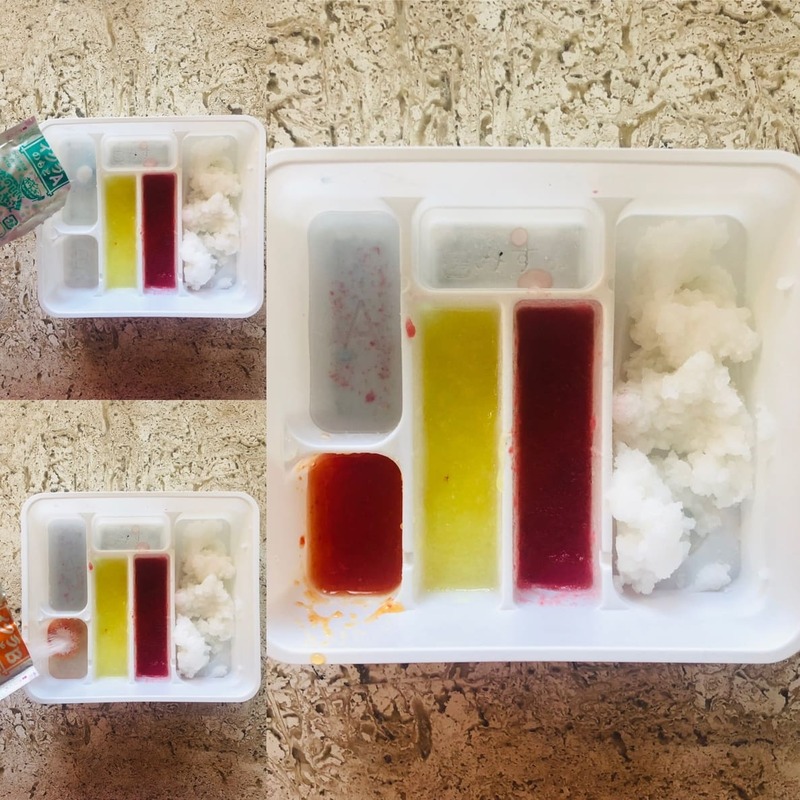 Because the compartments are so small, you are forced to make gentle movements to avoid overflowing any of the mixtures into the wrong cell; I was put into a meditative state because of the necessary focus. 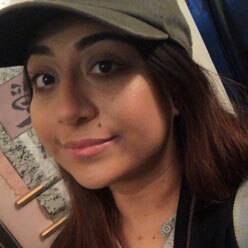 The motions and sounds of mixing were entrancing and it recalled a similarity to the ASMR videos I love. Despite my intention to be as cautious as possible I am just not coordinated enough for that kind of precision. Some of the rice powder from earlier had sprinkled into various chambers and my "roe" suffered because of it. They were less like eggs and more disfigured into comma-like shapes. It was fun to see the small eggs form as if it was a science experiment. As soon as the orange fluid comes into contact with the blue water, it rushes to arrange together without getting stuck to the others. I understand that soy sauce is an important part of sushi, but the visual of it in this situation made me a little uncomfortable. The brown color represented soy sauce exactly and that's not exactly appetizing for candy, even if it doesn't taste like it. Stretching the seaweed was no easy feat. I wanted it to be as smooth and perfectly straight as it looked on the box. 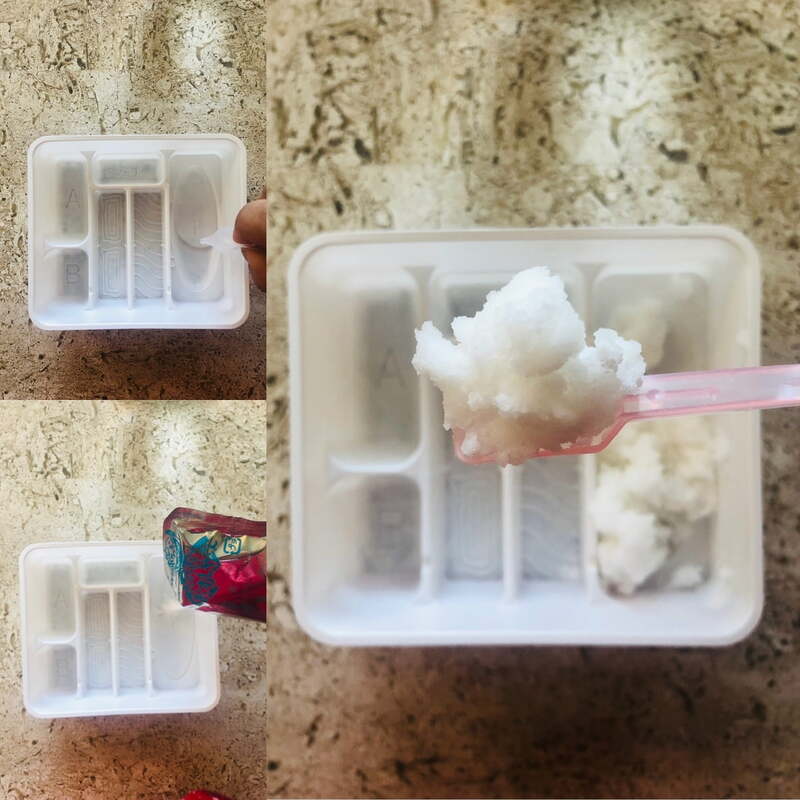 It had the texture of thick gum and the more I pressed into it, it brought out thin white lines instead of a solid and shiny black color. On the other hand, the measuring space for the rice was satisfying to use. I measured my little rice balls happily and honestly, if I didn't have it I would have probably made them all too big. The instructions say to split the egg and tuna in halves to make your sushi. As a tuna lover I have to say it looked so real, the color is perfect as well as the consistency. The egg was a nice color but egg isn't usually as slimy! The seaweed wrapped around the rice well enough but I couldn't figure out how to seal it closed without squishing all of it. Here is my masterpiece! Okay, some angles are better than others. Now as for the taste? When I popped the tuna into my mouth it was the strangest sensation. The texture of the sushi was on point. It was exactly what you would expect from it, but the taste was so sweet. It wasn't grape or cake or bubblegum, it was just sugar. The texture of the fish was perfect, and the egg a little slimy. The salmon roe had a skin that popped and released the juice into your mouth just like popping boba. It was fun, but I couldn't bring myself to eat more than one to be honest. It was a fun little project. It satisfied my tiny food obsession and I got the ASMR tingles from the mixing and squishiness of the rice. The taste, however, was awful and I probably would not recommend that you eat this. 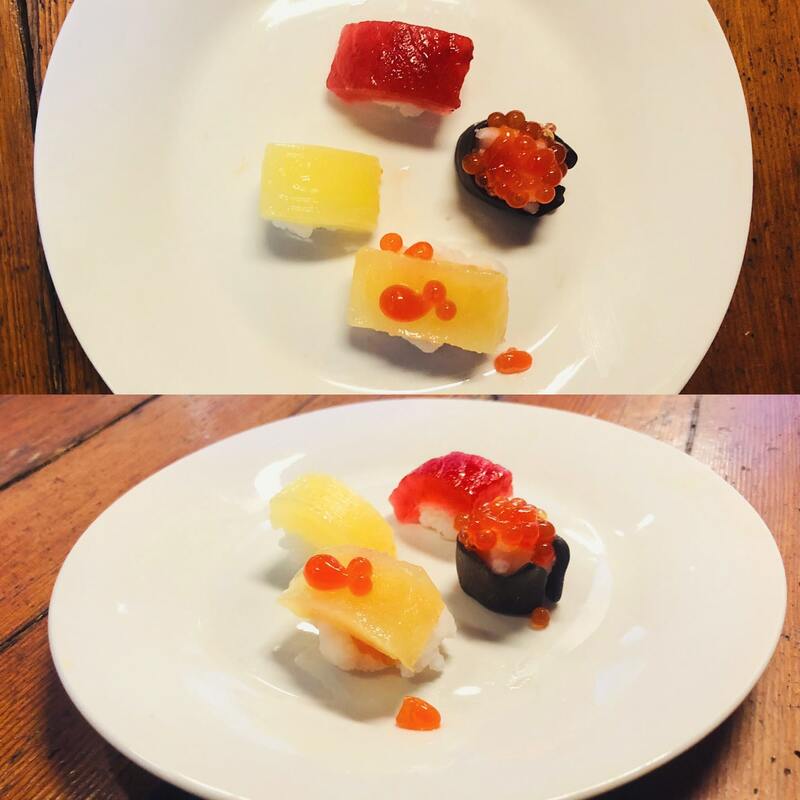 If the sushi firmly held its shape it would not have been so bad. The texture of the sushi was almost too realistic and the melt in your mouth experience I love from quality fish was not what I needed from this sugary clump. I saw several other kits at 7-Eleven that make noodles, rice cakes, and donuts. Those are a little scary after the flavor I got from this, but honestly I'm still going to try it. To my knowledge, this can be found only at the 7-Eleven in San Gabriel, CA on Las Tunas drive for $7.99.